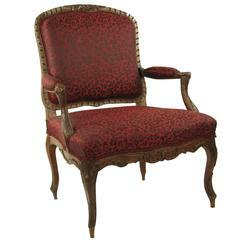 A good mid-18th century French oak high back open armchair. 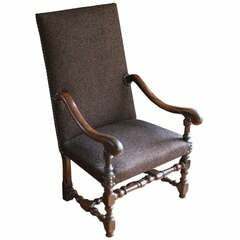 The upholstered seat and back with shaped arms and apron standing on fine cabriole legs joined with cross stretcher and central carved boss. The apron carved on all sides with central shell motif and scroll and foliate decoration; the arm supports, legs and feet also carved with stylized leaf designs. 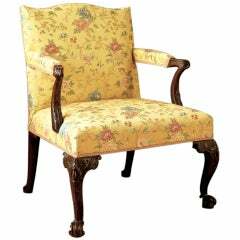 Standing well and extremely comfortable the chair has been reupholstered in our workshop and covered with a French embroidery fabric depicting a landscape view through greenery and berries. 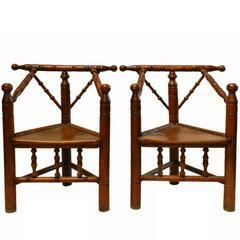 Seat measures: 19.5" high, 23" wide, 21" deep. Seat frame reinforced to take new upholstery and one stretcher restored. 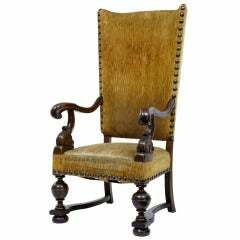 18th century French walnut high back armchair. 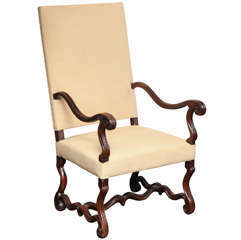 Turned and dowelled legs and gently curved arms with a deep antique patina. 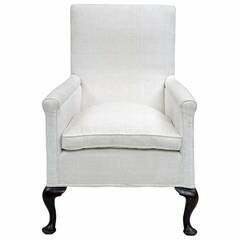 New upholstery and with nailhead trim. 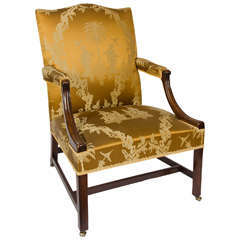 Rare Pearsall high back chair with original Hermes orange fabric. Condition of fabric is very good especially given age, late 1950s-early 1960s.